It is important to know that your body was designed to birth your baby. There are many important changes that take place during each trimester that are vital to the development and health of your child. • Second Trimester: Around the 14th week of pregnancy, your body hits the peak production of a hormone called Relaxin. This hormone allows ligaments to relax and your pelvis to widen, however, it affects all ligaments in the body, which is why many mother's feel a little uncoordinated. Your immune system shifts, your hormones surge, and you go from not being able to stomach food to having strange cravings and more energy. • Third Trimester: Your baby’s head sinks lower into your pelvis and a cascade of events begin stimulating your nerve system to release the hormone Oxytocin which begins your practice contractions (braxton hicks). You’ll notice your baby moving more and more as they prepare for life outside the womb. • Labor: If everything is properly in alignment, your baby’s head will engage and dilate the cervix and the nerve signals from your spine will send rhythmical signals to begin increasing the frequency and strength of the waves of surges in your womb, which finish with the arrival of the baby! If you are pregnant, one of the best things you can do is see a doctor of chiropractic. Chiropractic care provides so many things a pregnant body needs: a flexible and balanced spine, hips and pelvis; internal organs without postural stress and freedom from nerve stress – all essential for a healthy pregnancy and delivery. Awaiting arrival of your new baby will be a time of change for you and your body. Studies show that women are able to carry and deliver their babies with more comfort when receiving chiropractic care. Over the course of pregnancy, expectant mothers’ weight gain will reach somewhere between 20 and 40 pounds. The increase in weight can create spinal misalignment and/or postural distortions, which in turn affect nerves, muscles, and mobility of joints. In addition, many women experience heartburn, rib pain, pubic pain, headaches, sinus congestion and low back pain, often time because of the spinal changes that occur during pregnancy, many of which that were not there prior to becoming pregnant. Many women report relief of these symptoms while under chiropractic care. the physiological function of your muscles, the balance of your uterus, the alignment of your pelvis, all depends on clear communication between your brain and your body. This communication typically happens through your nerve system, but any interference can cause muscles to be stressed and strained which can lead to issues during pregnancy and labor. Lack of sleep, headaches, early “mommy brain” or baby sitting too high can are examples of how imbalances can manifest themselves. A pregnant woman needs to have her body as healthy and strong as possible in order to handle the rigors of pregnancy and childbirth. Chiropractic care will help ensure that all the body systems function optimally; especially the reproductive system including the uterus, ovaries and related organs and structures which are essential for a healthy pregnancy. If the body structure is causing the slightest nerve interference to these systems it could adversely affect the mother and the developing fetus. Dr. Kayla is certified in the Webster’s Technique, a specific chiropractic sacral analysis and adjustment, primarily for pregnant women. The goal of the adjustment is to reduce the effects of sacral subluxation/ SI joint dysfunction. In so doing neuro-biomechanical function in the pelvis is improved. Dr. Kayla will examine your body for these subluxations, and if found, she will correct them with a gentle and specific chiropractic adjustment. A chiropractic adjustment isn’t a magic button that will make all your problems go away. It is, however, a step towards clarity, physical balance and dealing with symptoms with good nerve energy rather than bad. At Feltz Chiropractic, we utilize the Webster Technique to help bring balance to your body so that both you and your baby can experience a safer and more comfortable birth. If you are experiencing any low back pain, or learn that your baby is breech, posterior or transverse, please consider chiropractic care. Receiving chiropractic care during pregnancy may help ensure that the expectant mother’s pelvic bones are balanced, often times facilitating a quicker, easier delivery. In one study, women receiving chiropractic care through their first pregnancy had 24% shorter labor times than the group not receiving chiropractic care. As the baby continues to increase in size, the mother's center of gravity shifts forward. In order to compensate, the natural curves of the spine exaggerate causing low back pain. Studies involving women receiving chiropractic care during pregnancy reported relief of back pain. Chiropractic care can provide freedom from interference of normal nerve energy, which is vital for the development of a healthy baby and mother. Post-partum chiropractic care is a must to ensure that the mother can achieve pre-pregnant status. Correcting subluxations within the spine and pelvis are very important considerations to achieve and maintain optimal health potential. 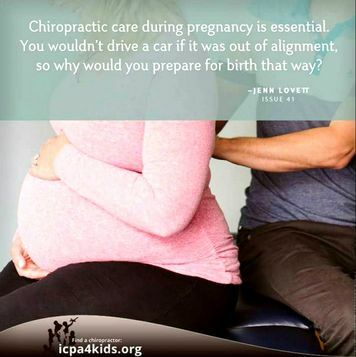 Chiropractic care for your new baby is also very important. Adjustments to newborns contain only ounces of force. This force is directed into the spine to facilitate health and remove vertebral subluxations. What better way to help prevent problems that may have arisen during the birth? We encourage you to join our community of moms who have discovered the difference in what we do. Brynhildsen J hansson A, Persson A, Hammar M, Follow-up of patients with low back pain during pregnancy. Obstetrics & Gynecology. 1998;91 (2):182-186. Phillips C, An effective drug-free approachto premature contractions. ICA Review, Oct 1998. Lisi AJ. Chiropractic spinal manipulation for low back pain of pregnancy: a retrospective case series. Journal of Midwifery & Women’s Health. 2006; 51: e7-10.